Breaking out of the C&C deadlock isn’t easy. 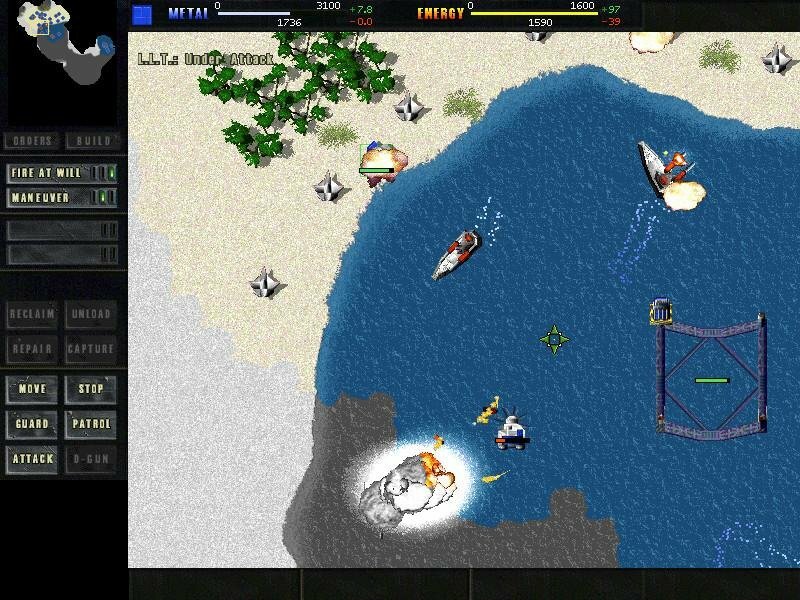 As a game of resource management and tactical combat, Total Annihilation is not fundamentally different from anything that has come before it. 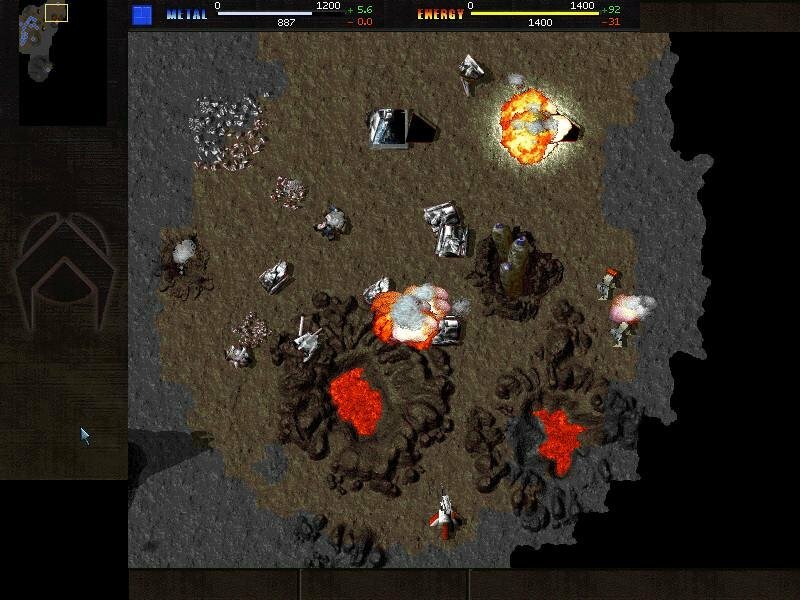 You build structures, gather resources, build up your war machine and go ballistic. But several substantial design machinations make TA quite a different beast. 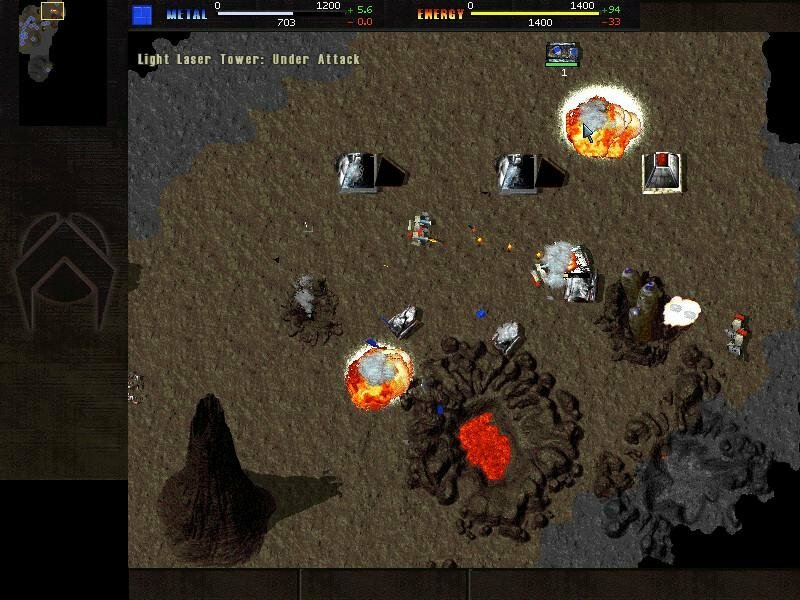 First off we have an early example of implementing 3D battlefields into the combat equation; there’s a simplified but clever resource management scheme that essentially leaves more focus on combat, and then there’s also the central ‘hero’ type character, the Commander, that basically runs the show. 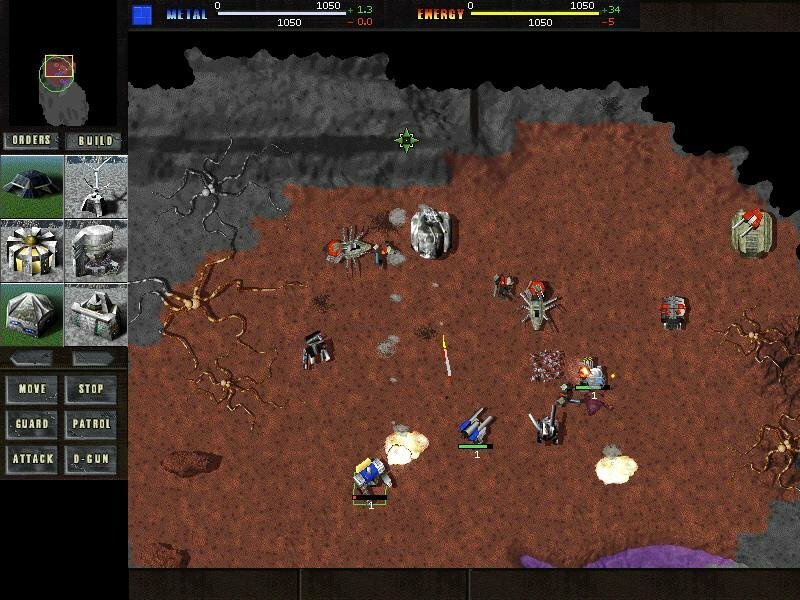 There are lots of cool improvements here, and, as such, Total Annihilation is quite a big deal. It’s far into the future and two opposing factions are fighting towards the bitter end. The Core believes that all humans should transfer their consciousness into machines and take advantage of the virtual immortality that it offers, while the rebellious Arm will have none of it. It doesn’t really matter who’s in the right, or whether you even care at all – the story is little more than a backdrop for the game’s epic battles. Choke points are a genuine hazard for attackers. 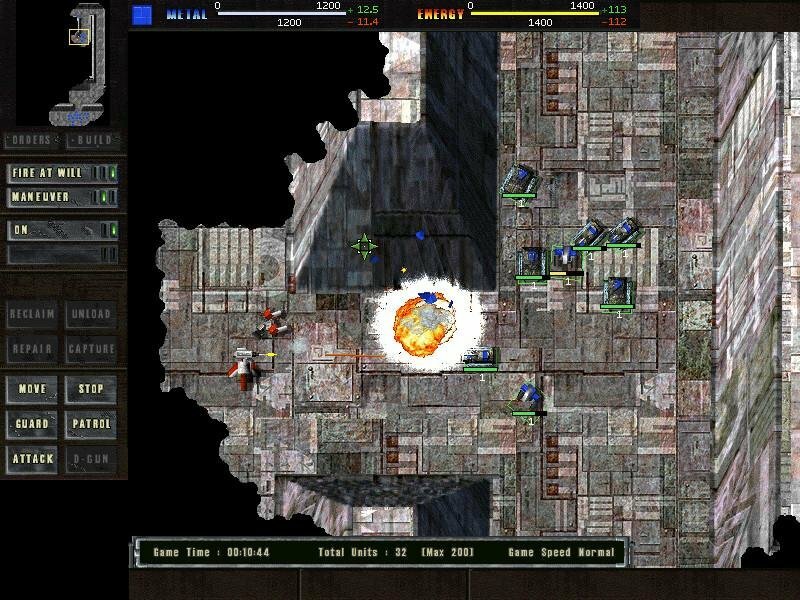 As either the Core or the Arm, the player moves from world to world, seizing tactical objectives and searching for the Galactic Gate which will enable them to carry the war deeper into enemy space and ultimately to the enemy’s home world. 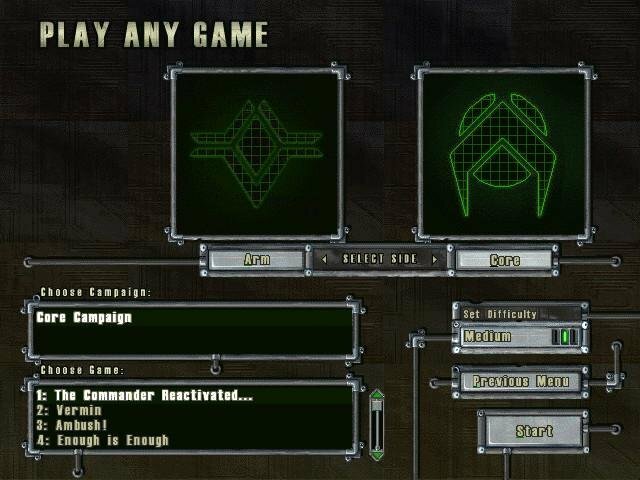 Both the Arm and the Core boast a single-player campaign of 25 scenarios, many of which are unique in setting and objective. Both solo campaigns are good, but a lot more could have been done to emphasize the story and potentially intriguing sci-fi theme. Even so, there are a good one hundred hours just in the singlepalyer missions, and online play is just around the corner. Don’t let the interface fool you. Although strangely minimalistic and not really imposing, it does do its job quite admirably. While the options it provides are simple and intuitive to learn and use, they can be employed in surprisingly complex ways. 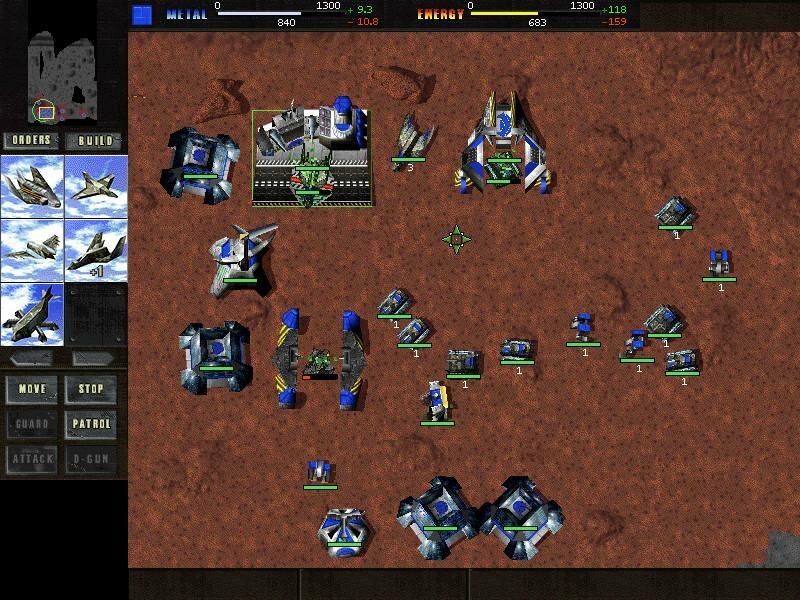 The player can give any number of multiple commands to units, for instance, simply by holding down the shift key while giving them. The unit will then carry out the commands in its queue in the order in which they were given. 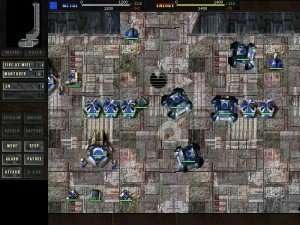 By giving units a number of tasks to keep them occupied players spend less time baby-sitting and more time planning their strategy. The units can also be given standing orders by toggling their aggressiveness and mobility traits, which control the amount of leeway they have in holding both position and fire. The only thing lacking is a formation option, but it’s otherwise a responsive system. The structures that produce units can be given multiple commands in the same way that the units themselves can – simply click on whatever units you want a structure build and it will churn them out in the order you entered. 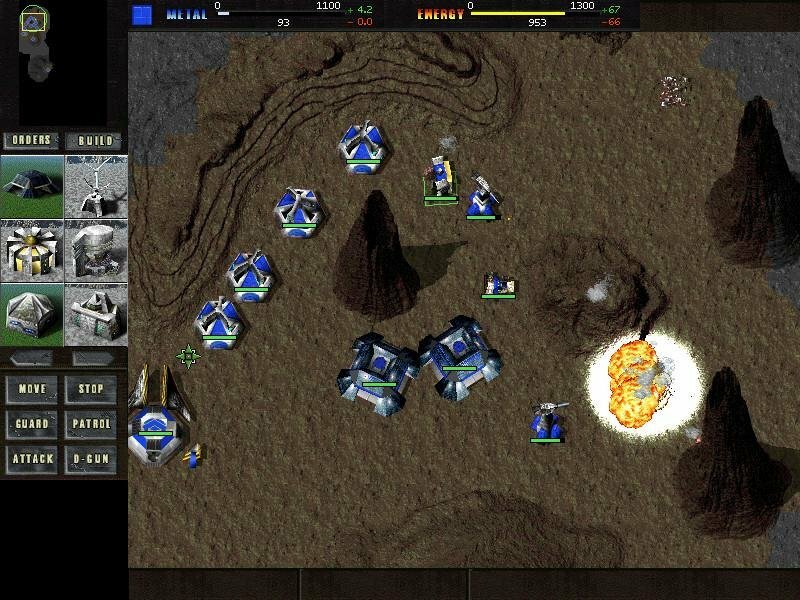 You can order the structure to produce units with specific mobility and aggressiveness settings, and you can even tell it where to send them when they emerge. Each feature seems to reduce the micro-management more than increase it. 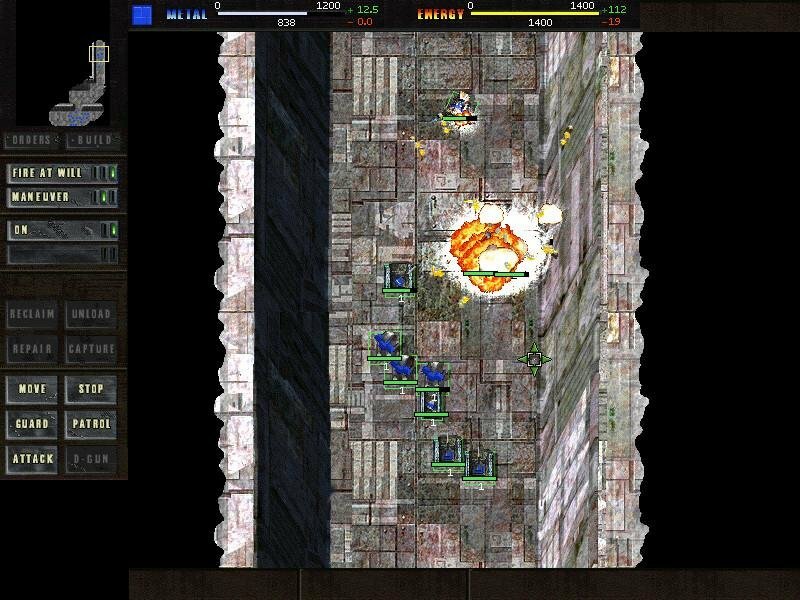 Best of all, the single-player interface allows players to pause the game. They can survey the battlefield, set standing orders, and give queued commands while the action is frozen. 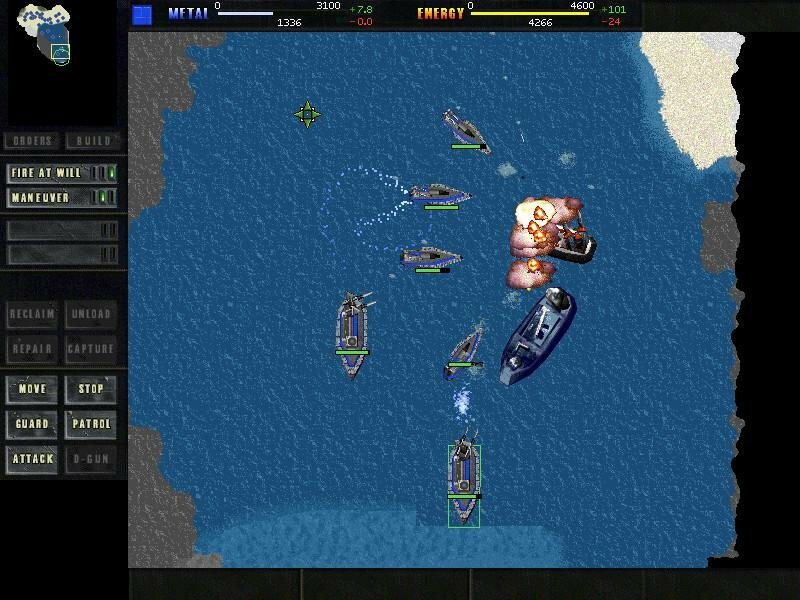 It is a very simple feature that addresses the biggest complaint on real-time games – the dominance of fast action over carefully planned strategy. In Total Annihilation you can have either or both, and the option is very welcome. 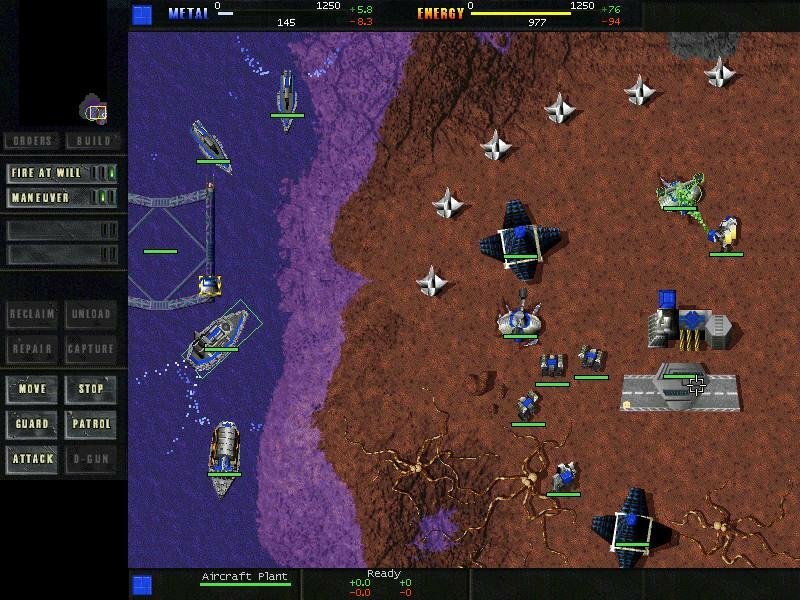 Taking high ground such as this is difficult… unless you resort to some bombing runs. Other innovations in gameplay are easier to recognize. 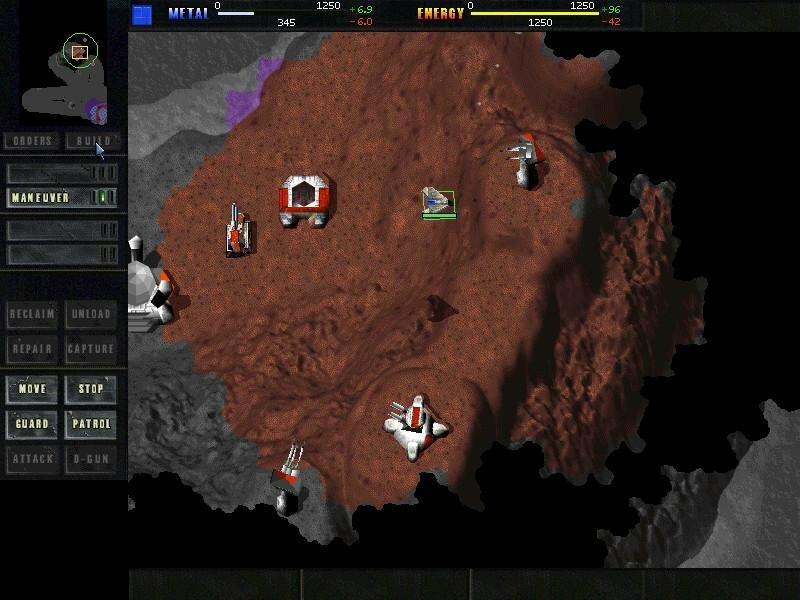 Both the terrain and the units are rendered in 3D, and while it makes for some neat visuals, it affects gameplay even more profoundly. Tanks and infantry tilt and roll on inclines, aircraft bank into turns and perform barrel rolls and wingovers. The terrain is a broad canvas of rolling hills and valleys, towering trees and dense foliage, boulders and craters and ruins. Terrain affects not only line of sight, but also line of fire. 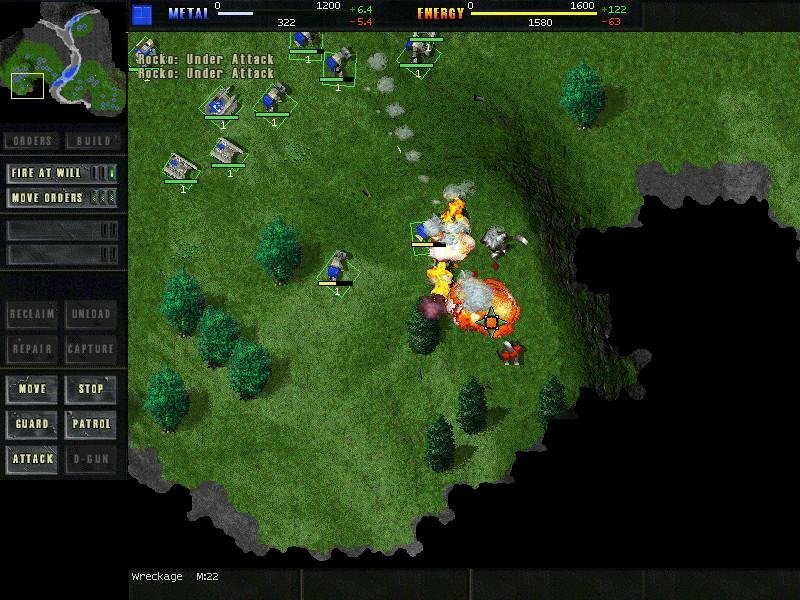 Many units employ flat trajectory weapons that can be blocked by terrain, but a variety of artillery and missile units and emplacements can lob shells over hills or even mountains. 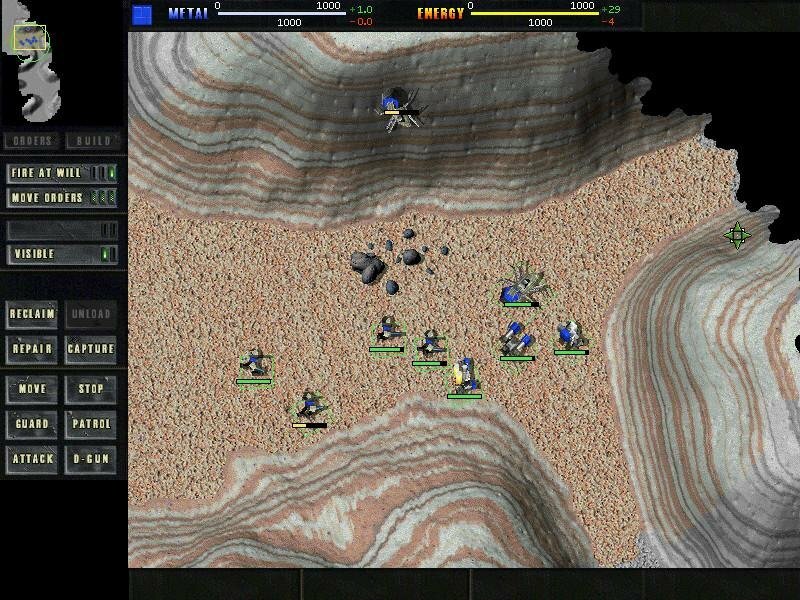 Place artillery on high enough mountains and you can use scouts to hit inside enemy territory. The physics are not limited to artillery trajectories, either. Wind varies in direction and speed in each scenario, and is largely dictated by the conditions of the planet on which the scenario takes place. 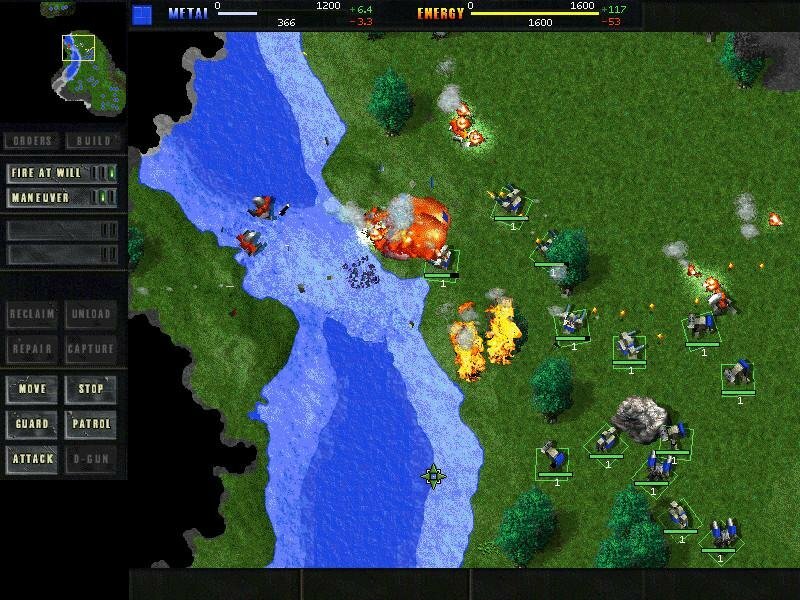 At first it may seem that this has little impact on the game aside from a few visual effects – wind generators turn to face the wind, and smoke streams from the wrecks of units in the direction the wind is blowing. The atmosphere of visceral realism this places on the battlefield is welcome enough, but watching as forest fires spread in the direction the wind is blowing reveals a system of physical laws which is more complex than is immediately apparent. 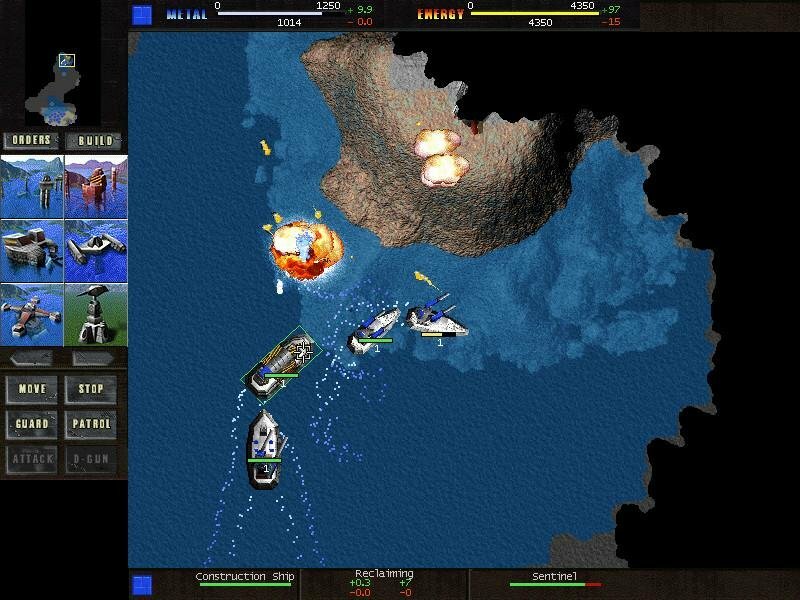 The game places a firm emphasis on a combined-armed force, and to that end it offers a dizzying array of ground, sea, and air units (more than anyone would need, to be honest). 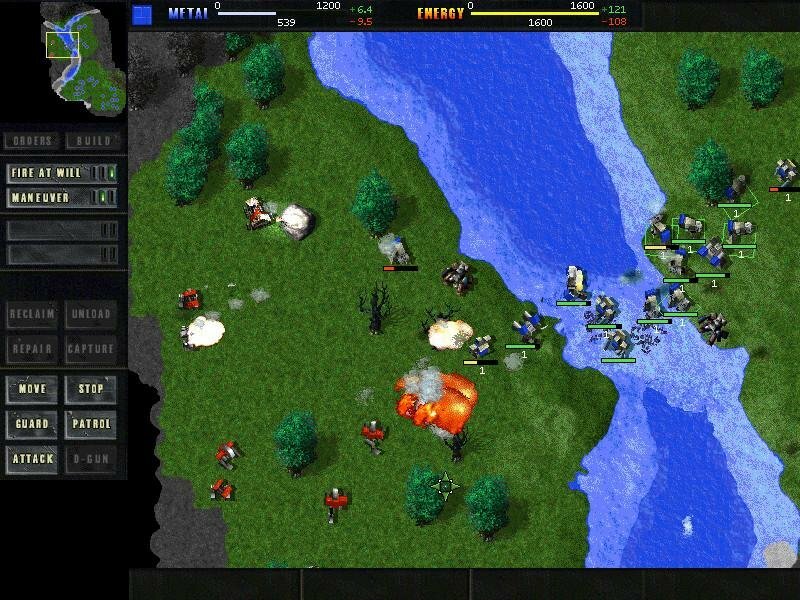 The Arm and the Core have roughly 75 units each, and while the roles of the units in each faction are largely similar, many units have their own distinct tactical advantages. 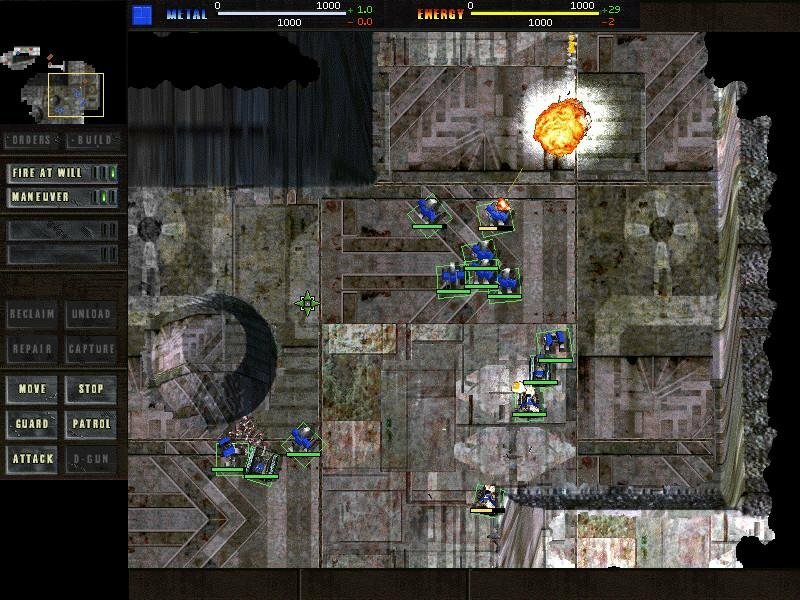 Several units, such as the Core’s mobile radar vehicle or the Arm’s “Spider” tank (which possesses the ability to climb sheer walls), are completely unique to a given faction, while other differences are merely cosmetic. 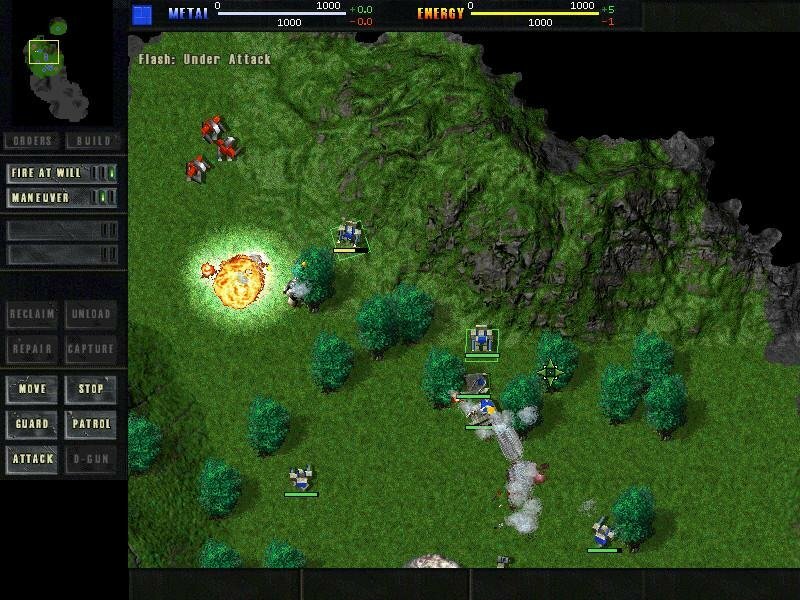 One essential unit employed by both factions is the commander, a unit which represents the player on the battlefield. 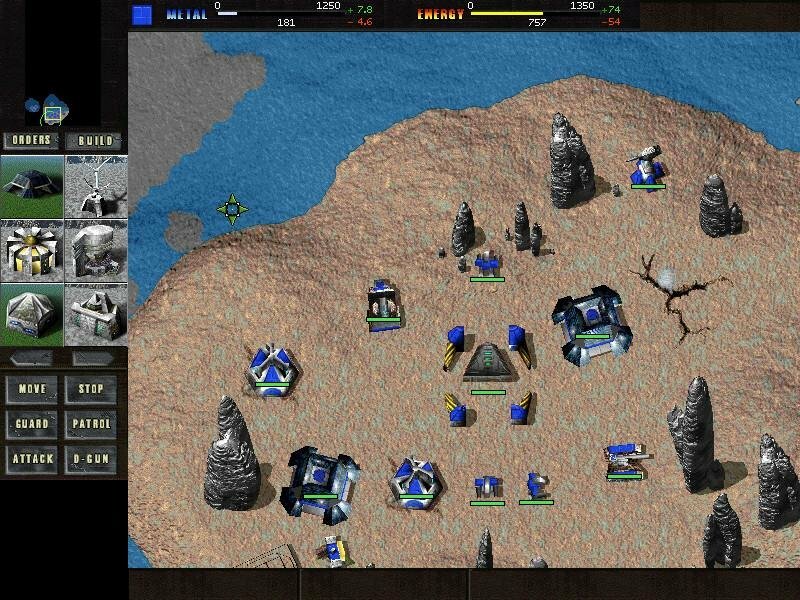 The commander can build basic structures and produces a small amount of the metal and energy resources needed to survive. He has powerful combat abilities as well, but using them is a risky endeavor – if the commander is killed the player loses the scenario. Building a base on the Core home planet. The development of structures needed to build these units is relatively open-ended, providing the player with opportunity to attempt a number of different strategies for building an army. 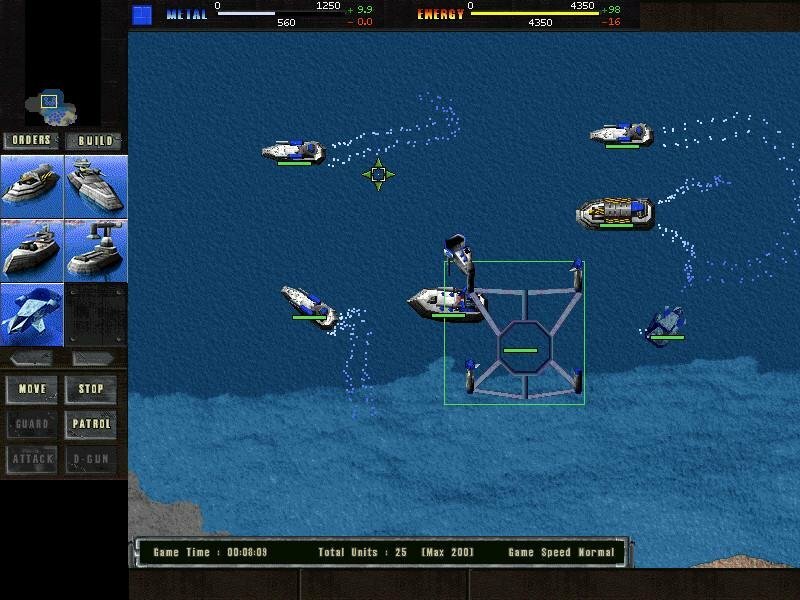 Infantry, armor, aircraft, and naval units each have a separate construction hierarchy, and players can opt to develop these elements in any order. These elements compliment each other on the battlefield, and mutual support roles are as beneficial as one might expect. 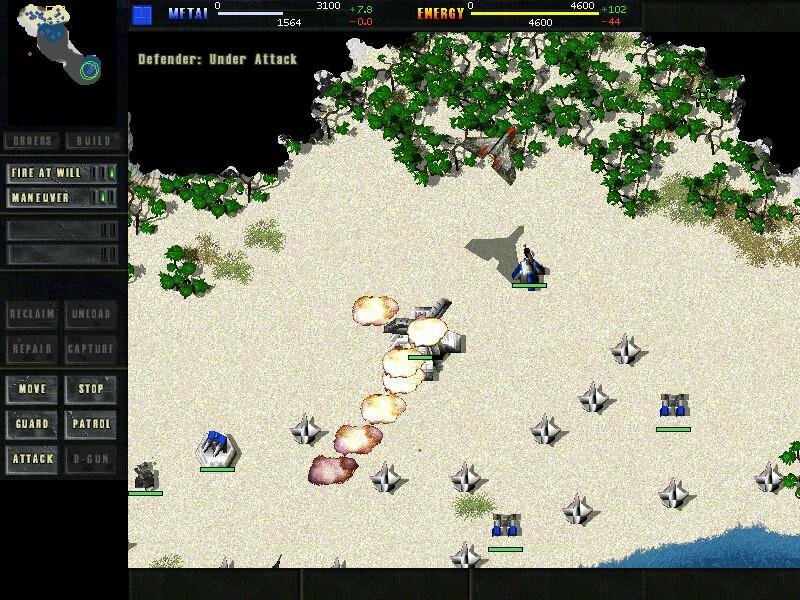 More so than any other real-time strategy game that has come before, Total Annihilation presents the player with a large variety of battlefield tactics that work in a believable and logical fashion. Are there any flaws in this real-time gem? Unfortunately there are a few. While the AI in the single-player campaign mode is quite challenging, it performs less impressively in single-player skirmish mode. The manual is vague and uninformative, and while it explains what each of the interface controls is for, it fails to adequately explain how to use them. Only the intuitive nature of the interface keeps this from being less damaging. 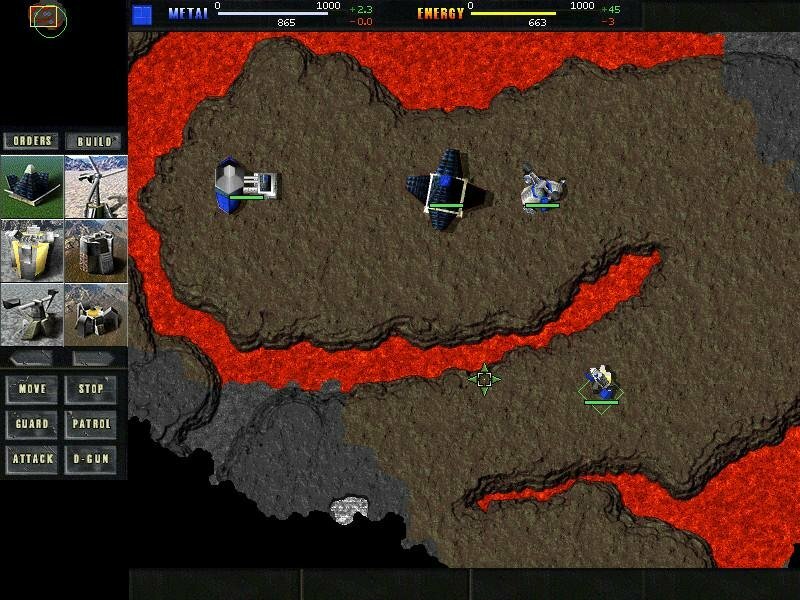 None of this significantly mars the fun or the excellent tactical gameplay, however, and Total Annihilation greatly surpasses its predecessors in both areas. Here is to the evolution of the genre. 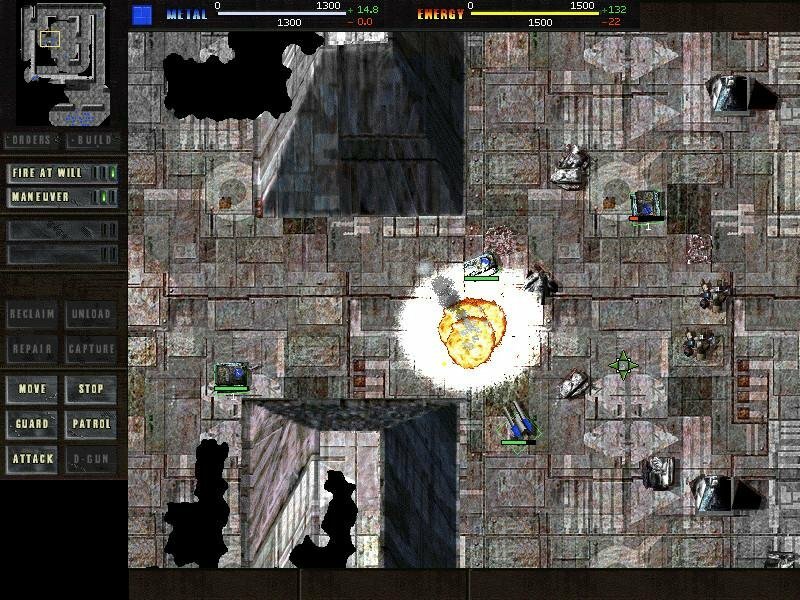 Best Game Ever you need to play it and this is ammazing so much games to download go on this website for the best GAMES!